In the foreground of this picture stands a magnificent statue of an angel that sits on the top of the Notre-Dame-de-Bon-Secours Chapel in Old Montreal, Quebec. This chapel is one of the oldest churches in Montreal and directly behind the statue, the unique dome of the Bonsecours Market adorns the skyline. 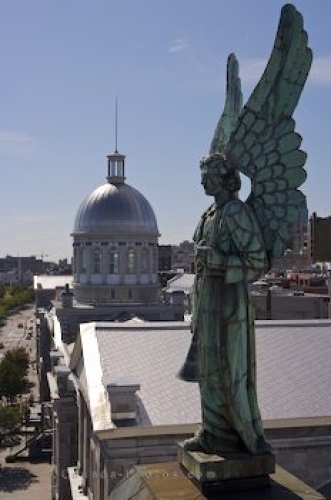 Angel atop the Notre-Dame-de-Bon-Secours Chapel and the dome of the Bonsecours Market, Marche Bonsecours in Old Montreal, Montreal city, Quebec, Canada. Picture of an angel statue atop a church in Old Montreal in Quebec, Canada.